Dominion 88 Rink Roller Skate Made in Canada! DOMINION 88 Rink Skate - Last ones available Mens size 9 only! Get your Groove On with this classic Roller Skate Dominion 88 Made in Canada! 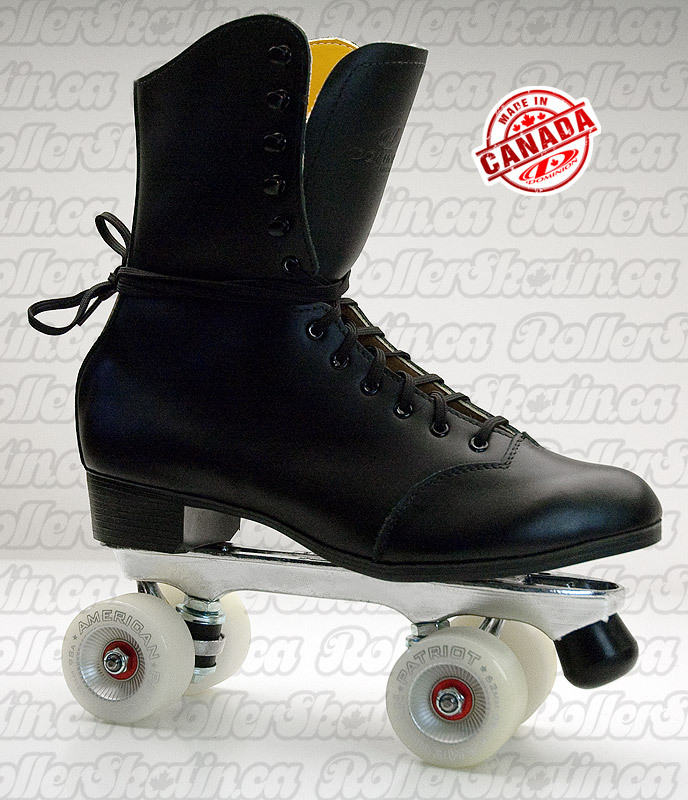 Get Your Groove On with this classic tall boot Roller Skate Made in Canada by Dominion! A little taller than the 671 skate, this one features a slick microfiber lining and shearling tongue with a closed toe design featured stitching - a throwback to the old Dunne's brand from back in the 1930's! This is a very well made simple Roller skate boot for those that want a tall bot but not all the fuss and padding of more expensive figure style boots. Comes standard with a Dominion Marathon V plate, with 5/8" stopper hole, ABEC 7 bearings and Choice of 98A Dominion Patriot wheels! Upgrades available for bearings, wheels and plates with choice of 5/8" stoppers or dance plugs. Classic Roller Skate design, tried tested and true. Select Mens (Black boot) full sizes only as shown in the pulldown menu above (Ladies go down one size ie. M8 = L9). • Last ones Available Mens size 9 only! DOMINION 88 Boots - Last ones in Mens size 9 only! American Patriot Recreational Indoor Wheel 98A 57mm Set of 8! American Patriot Recreational Indoor Wheel 98A 62mm Set of 8!